First issued in 1989 and named for the Vienna Philharmonic orchestra (Wiener Phiharmoniker) which is the design on both sides of the coin. It was intitially minted in two sizes – 1oz and 1/4 oz. 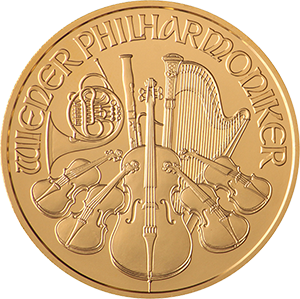 The Philharmonic coin, sometimes referred to as The Vienna Philharmonic, is a bullion coin made from gold, silver or platinum and released by the world renowned Austrian Mint. First introduced in 1989, it was one of the last major mints to start producing bullion coins after most began the process in the late 1970’s or early 1980’s. The South African Krugerrand made up the vast majority of the gold bullion market, more than 90%, but the Philharmonic soon made up for lost time and became a popular choice for investors and collectors alike, due to its high level of purity. 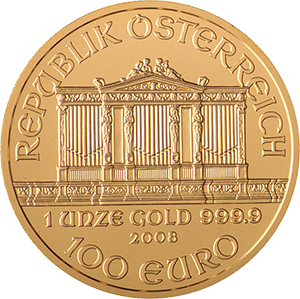 The 1 oz Philharmonic has a face value of €100, previously 2,000 ATS (Austrian Schillings) up until the adoption of the Euro, but its gold content alone makes it a far more valuable item than its given nominal value. At 24 carats, it is one of the purest gold coins on the market, but, as is the case with all fine gold of this quality, it needs to be stored and handled carefully as it can be malleable. The diameter of the 1 oz Philharmonic is 37mm, quite large for a coin of this type, and it has a thickness of 2mm. The edging is reeded and the coin weighs a total of 31.103g. The coin’s design remains unchanged year on year and both the obverse and inverse of the coin depicts the Vienna Philharmonic (Wiener Philharmoniker) that the coin’s name is derived from. Each year the Vienna Mint calculates demand for the Philharmonic coin, which has typically grown substantially since its introduction in 1989. The coin’s first mints only included two weights, the 1 oz Philharmonic, which remains the most popular and iconic of all issues, and a 1/4 version. The Vienna Mint has since added 1/25 oz, 1/10 oz and 1/2 oz versions.